ACFIL will once again conduct a One-day SEMINAR ON FINANCIAL LITERACY and ADDRESSING BARRIERS TO REINTEGRATION. This time it will be in collaboration with Iganap Guardians Torino Chapter and Federal Land Europe. 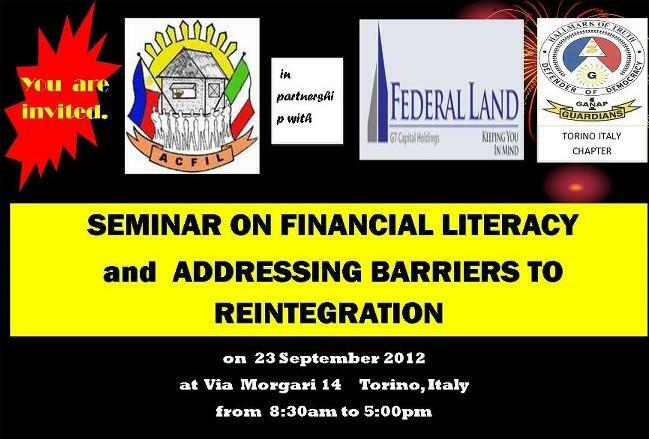 The said seminar will be done on September 23, 2012 at Via Morgari 14, Torino from 8:30am to 5:30pm. to introduce PINOYWISE campaign and as a concrete savings and investment vehicle. Don‟t miss the chance be enriched and financially literate. Join the seminar. Participants are limited to 40 persons only. For more information, please contact Minda Teves-3661827310 ; Sally Bajade Cuballes-3202979964 and all Financial Counselors- Jocelyn Beltran, Nerissa Tejada, Rhoda Parala, Gina dela Cruz, Marjorie Dinamling and Kristine Bautista. Casa del Quartieri, Via Moragri 14 Torino will be celebrating its foundation day on September 22, 2012. ACFIL, being one of the occupants of the place, will participate in the said event by promoting Philipines‟ pride “ It’s more fun in the Philippines” through audio visual presentation and showcasing folk dances and tagalog songs. Acfil is assigned to perform at 6:30pm of the said date. Everyone is invited to join us in the celebration.